As a lifelong horsewoman and psychotherapist, Melisa began developing her Equine Gestalt Coaching Method® while working with clients for private sessions and retreats in Flagstaff, Arizona in 1989. Through her therapeutic Gestalt work with clients on her ranch, Melisa discovered people became more grounded, centered, confident and secure when working with horses using her methods. This inspired her to expose a wide range of people to the beauty and wonder of the horses experientially. 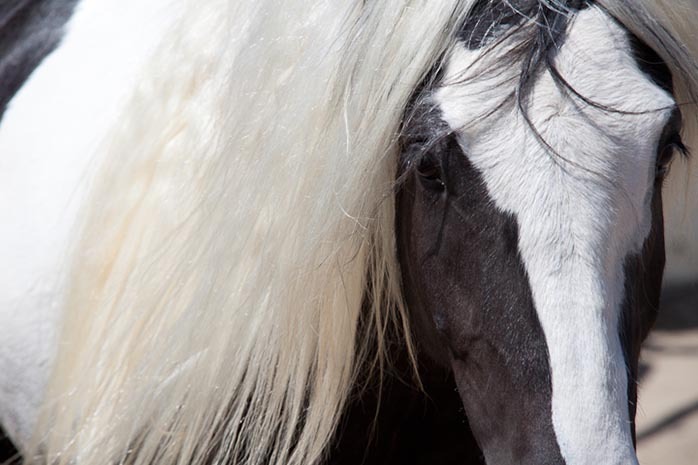 The integrative approach of horse interaction combined with positive coaching and Gestalt guidance assists clients in examining their life and choices made with a focus on designing a positive future. Redesigning her own life, Melisa and family moved from Arizona to Colorado where she established her parent company Touched by a Horse® Inc. through which she offers her coaching for individuals, groups and business owners. Touched by a Horse® also markets her unique products retail to individuals and wholesale to stores. In 2001, her long term friendship with Equine Artist Jan Taylor, inspired the creation of the inspirational deck Whispers from a Horse’s Heart. This 52-card deck is beloved by horse trainers, coaches therapists and individuals as they select a card for “horse wisdom” daily. Jan’s artwork and Melisa’s Spiritual messages culminated in the deck hitting the Best Sellers list on Amazon. As a hypnotherapist, Melisa went into the sound studio next to create her guided imagery CD “rides” for the listener who may or may not have a horse in reality. . . but now can ride anytime. The Wisdom’s Journey series tackles topics of Manifesting your Future, Balancing the Chakras and Creating Abundance. Selected as one of 10 horsewomen to be a contributing author for the book Horse as Teacher, Melisa wrote about her pathway to authenticity through her horses. 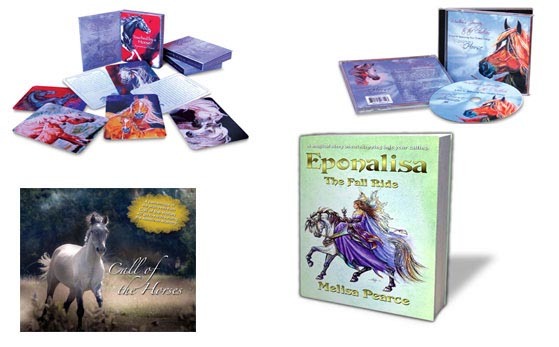 In 2009, this was followed by her own award winning book Eponalisa (cover art by Jan Taylor. . . illustrations by longtime friend and assistant, Diane Halenda). Touched by a Horse® has promoted Melisa as an Equine Clinician and keynote speaker. 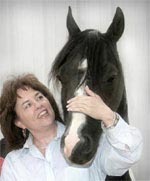 Melisa developed a powerful and unique message about the clairesentience of horses, honoring their vibrational field, the spiritual connection between horses and humans as well as the importance of human and horse chakra connections. She was chosen as one of the top 50 horsewomen in the US for her seminal work. Touched by a Horse® stays busy in the ongoing development of new products and learning tools for enhancing the interaction of people with their horses. Custom designed dowsing rods, horse hair natural pendulums, her deck and her Chakra Arena Banner featuring her stallion, Go Robin Bar, help horse enthusiasts learn about these modalites. In 2008, Melisa felt guided to launch her Touched by a Horse® Certification Program for those who desire to study with one of the founders of this sector of the Equine Industry. Students enroll from all over the country each quarter for the intensive 500-unit course. The Certification course offers teleclasses so students may study at home in addition to 8 CORE sessions at Melisa’s faclilty in Colorado over a 18-month to two-year time span. Whatever reason caused you to stop by today. . . we are glad you have. If you would like to reach Melisa personally you can make an appointment through our office by emailing to office@touchedbyahorse.com.